In California and the southeast U.S., forest cleanup and fuel mitigation projects, intended to reduce the risk of catastrophic wildfire, are being postponed. In Tennessee, a wildland fire training academy was canceled. In Montana, a workshop designed to help forest managers better prepare communities for fire risk has been scuttled. As the partial government shutdown stretches into its third week, becoming the longest shutdown in U.S. history, hundreds of thousands of federal workers remain furloughed. That includes thousands of people at the U.S. Forest Service, the National Park Service and the Bureau of Land Management, who would otherwise be preparing for the upcoming fire season or working on projects to reduce wildfire risk. That lost time is raising concerns from fire officials around the country. "We're fortunate in that fire potential and the fire danger is relatively low across the country at this point," said Dan Smith, the fire director for the National Association of State Foresters and a board member for the National Wildfire Coordinating Group. "But this is the time of year where we make plans and work out processes for the coming year." With few federal workers left on the job, much of that important planning, training and contracting, he said, is being canceled or postponed. So too are fuels mitigation projects - prescribed fires or thinning operations - that fire ecologists and forest managers say are vital to reducing the threat of massive, deadly wildfires that have become all too common in many parts of the country. 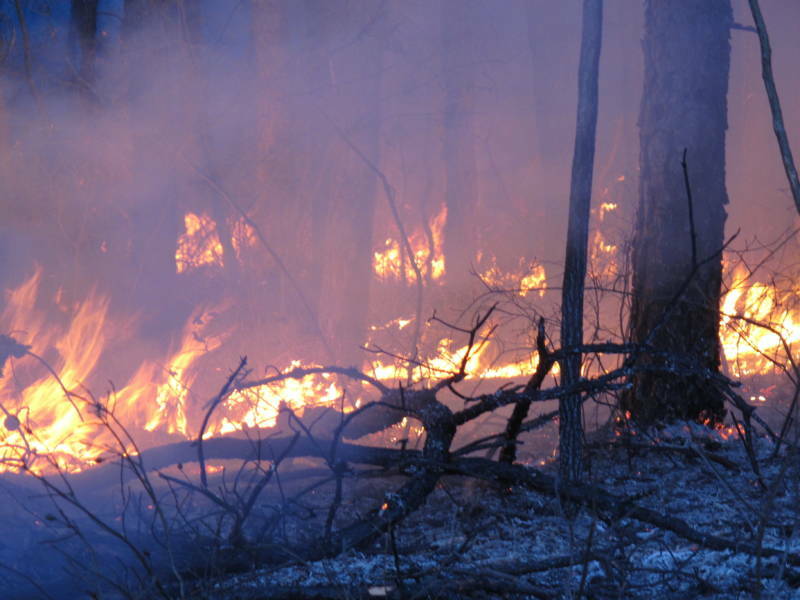 "This is the prime time of year for a lot of acreage being burned, especially in the southeast," said Jim Karels, the director of the Florida Forest Service, a state agency that has continued to do its own prescribed fires. "[Federal agencies] are missing quite a few good burning days and a lot of opportunities to reduce fuel." That's also the case in California, which is still recovering from the most destructive and deadly fire season in its history. President Donald Trump has repeatedly criticized California for its forest management policies, tweeting about it again this week and threatening to cut off emergency funds to the state. Last month he also issued an Executive Order calling for more "active management" of forests and other federal lands to reduce wildfire risk. But more than half of the forests in California are under federal control, where prescribed fire - widely viewed as one of the most useful forest management tools - is no longer happening. Forest managers have already lost out on at least 14 good days for burning, the California Tahoe Conservancy told Capital Public Radio. "Every week is critical," said Patrick Wright, the executive director of the conservation group. "Hundreds, if not thousands, of acres could be affected if the shutdown continues for an extended period. There's the potential for missing an entire field season." Asked how many fuels mitigation projects like prescribed fire or thinning efforts have been affected by the ongoing shutdown, John Haynes, deputy director of communications at the U.S. Forest Service, wrote in an email: "We are unable to speculate on specific impacts such as those you are asking about while the government is ongoing and ever-changing." Training opportunities for state, federal and local firefighters are also being put off. The Tennessee-Kentucky Wildland Fire Academy, a 25-course, two-week training event, was canceled earlier this month. Tim Phelps, the Forestry Communications and Outreach Leader at the Tennessee Department of Agriculture, said that roughly two-thirds of the academy's attendees and many of its presenters were federal employees. "That limits much-needed training, everything from basic firefighting to more advanced courses," he said. "We're scrambling to figure out how to now get our state folks the training that they need." Phelps and other state land offices said that this shouldn't immediately affect their ability to respond to wildfires. State and local firefighting agencies put out the majority of the nation's wildfires and can find other ways to get critical training. It could be a setback, though, for individuals who are looking for specific qualifications for the upcoming fire season, and it could disrupt the larger flow of the country's fire management structure. "Some of the training sessions that are being canceled feed people into our incident management teams, and our incident management teams have some critical shortages in them. So it just puts us behind in that process of developing a pipeline of succession," Michael DeGrosky, chief of the Fire Protection Bureau at Montana's Department of Natural Resources and Conservation, told Montana Public Radio. A three-day workshop in Montana that aimed to improve the way fire and natural-resource managers work with communities to build wildfire resilience was also canceled due to the ongoing shutdown. While the workshop's cancellation won't impact the immediate preparedness of firefighters in that state or others, Philip Higuera, an assistant professor at the University of Montana and one of the workshop's organizers, said it's a setback. "This is an example of how the shutdown has more far-reaching consequences than we - citizens, scientists, or politicians - initially anticipate," he said.